Summoned by mysterious, telepathic forces, the beautiful Carol, who seems to have no memory as to her true identity, is determined that she must get to the lost city of Kuma and death is the reward for anyone who tries to stop her. In the city, she is awaited by Killikrates, now immortal thanks to the effects of bathing in the sacred flame. He has been persuaded that Carol is the reincarnation of his lost love Ayesha, but is she really ‘She’ or just a normal young woman chosen at random by someone who wishes to exploit Killikrates’ obsession? Despite the predictions of producer Aida Young that Olinka Berova had a great future ahead of her, she seems never to have been heard of again! 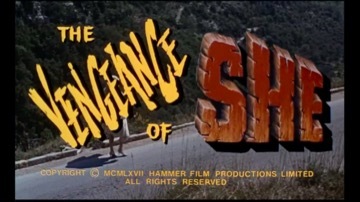 The films marks the last appearances for Hammer of Noel Willman, Andre Morell and John Richardson. The director Cliff Owen was more established in the field of comedy. His films include “The Wrong Arm of the Law” (1962) and the Morecambe and Wise vehicles “That Riviera Touch” (1966) and “The Magnificent Two” (1967).